In the event that you should ever need to evacuate your home with your pet, the Groton Evacuation Shelter has some important information to keep handy. 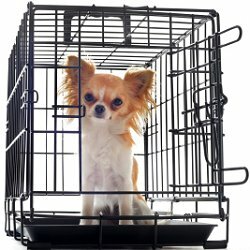 Your pet will be assigned to its own kennel. Small carriers can be placed inside if that helps your cat or small dog feel more secure. Food to last 7 days in waterproof, airtight container. Shelter provides water. You will arrive at the shelter parking lot with your family and pet belongings. You’ll be advised to leave your pet/s in the car while you register yourselves. When you are each registered and are wearing a numbered registration bracelet, you’ll return to your car for your pet/s. At the animal area, you will fill out lengthy but important forms about your pet. You’ll produce rabies vaccination tags or numbers. You’ll list any toys or other items you are leaving with your pet. The member/s of your family who will be feeding your pet/s and walking your dog will be photographed with your pet. You will be responsible for feeding your pet and walking your dog during your stay. The shelter will provide water and supervision at all times. A log is kept with each animal to record feedings and walks. Animals will remain in their kennels at all times except when dog walking. When you leave, you’ll be asked to sign paperwork documenting the safe return of your pet and any pet items that are yours. Pets that are not picked up will be taken to the Groton Animal Control Facility and you will be charged a daily fee.